Over the fence and into it! Fred Fitzgibbon will forever be remembered for jumping the fence and joining in an all-in brawl during Carlton’s 1945 ‘Bloodbath’ Grand Final victory over South Melbourne. Unfortunately, that episode overshadowed a fine career by a talented player who went on to be one of the stalwarts of the 1947 Premiership team. Following a brief period of military service, Fred (who was born in Benalla) came to the Blues from VFA neighbours Brunswick, in the fourth year of World War 2. The VFA had suspended its competition after the 1941 season and dozens of quality footballers were signed up by VFL sides. Fred was a feisty customer – a product of Melbourne’s working class northern suburbs. Growing up during the Depression years, he had learned his football the hard way, honing his skills in what was then the toughest school of all. In those days the standard of VFA football gave nothing away to the VFL, but Association players usually only got paid if they won – so physical intimidation of your opponent was not only expected, it was actively encouraged. In Carlton’s guernsey number 8, Fred soon showed that the decision to sign him was a sound one. Aged 24 on debut, his maturity and experience made him a popular winner of the club’s Best First Year Player award in 1942. He was a tenacious, no frills wingman with pace and good disposal, and he was already proving a handful for any opponent. By 1945, Fred often ruled his wing at Princes Park, as well as at most of the other league grounds. In August of that year, the carnage of the war finally ended at the dawn of the atomic age at Hiroshima and Nagasaki, and four weeks later in Melbourne, it was football finals time again. The Blues qualified in fourth place, three wins shy of ladder leaders (and hot flag favourites) South Melbourne. But Carlton’s cause was dealt a serious blow when Fred was reported on the eve of the finals. Despite a vigorous defence, he was found guilty and suspended for four matches. Nevertheless, in the first two weeks of the finals Carlton surprised with an easy win over North Melbourne in the First Semi-Final, then beat Collingwood by ten points in a vicious and spiteful Preliminary Final, to earn a crack at South for the Premiership. We were rank outsiders, but playing at home (because the MCG was being used as a transit centre for Allied troops) and under the inspirational leadership of Bob Chitty. If nothing else, the Blues were confident and ready. Somehow, almost 63,000 spectators crammed into Princes Park on that cool, overcast September day, to see the skirmishes begin almost from the first bounce. But it wasn’t until after quarter time that the real trouble began. Carlton’s Ken Hands was felled, then Chitty ran through South’s Ron Clegg as the game deteriorated into a series of running brawls. Fists, knees, elbows and boots were all used freely and even bottles were aimed at players from the terraces, as police and the central umpire struggled for control. Carlton were 23 points up at three quarter time before South mounted a last charge for glory. After causing mayhem all match, Chitty was collected by an errant elbow that sent him reeling with one eyebrow split wide open. But he got to his feet, wiped the blood away and kicked an inspirational goal as the Blues began to look like winners. Minutes later, Blues’ rover Jim Mooring was flattened, and Fred Fitzgibbon could take no more. In his street clothes, he vaulted the fence and took on South’s Ted Whitfield toe to toe. Only police intervention stopped the bout, as Fred was arrested and escorted from the ground. Whitfield pulled his guernsey over his head and ran upfield in a vain attempt to prevent the umpire from identifying him. The game ended in an infamous victory for the Blues by 28 points in a match memorable for all the wrong reasons. Ten players were reported afterward, and nine of them were found guilty of a wide variety of offences – including Fitzgibbon who copped an extra four weeks for his unexpected intervention. Whitfield was outed for the entire 1946 season on a string of charges, including striking and attempting to avoid identification. After the passing of more than fifty years, it’s difficult to ascertain if Fred’s subsequent career was driven by any ambition to make up for the opportunities lost in 1945. What is plain however, is that his career reached new heights in 1947, coinciding with the arrival of Carlton’s new captain – West Australian champion Ern Henfry. 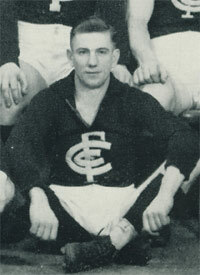 One of the greats of his era, Henfry led the Blues into the 1947 Grand Final as favourites against Essendon. Capping a superb year all round, centreman Henfry had that year’s Brownlow Medallist Bert Deacon behind him at centre half-back, and a still ferocious, yet more settled Fitzgibbon beside him on a wing. Perhaps inspired by the skill and poise of Henfry, Fred had played solid, consistent football all year and hadn’t missed a game. Carlton’s fabled one point victory over the Bombers – thanks to a great snap shot for goal in the last minute of the Grand Final by rover Fred Stafford – marked the pinnacle of Fitzgibbon’s career. It wiped out any lingering resentment over past indiscretions, and ensured that his exploits on the playing field for the Blues could be celebrated for all the right reasons. Like David Rhys-Jones exactly forty years later, the bad boy had redeemed himself. Fred Fitzgibbon played just one more season for Carlton in 1948, and retired with perhaps just one regret; that had he not run foul of the judiciary so often, he would have undoubtedly passed the 100 game milestone. But we doubt that would have mattered all that much to Fred. He was a loyal son of the Navy Blue for the rest of his life, which ended peacefully on January 24, 1999 aged 81. At the time of writing (2009) Fred’s legacy still lives on with his daughter Barbara, who is among the most prominent supporters at each and every Carlton game. "F. J. Fitzgibbon, who played non stop football with Carlton seven years, mostly as a wingman, was appointed coach of Deniliquin Football Club at a special meeting this week. Fitzgibbon will be paid £10 per week plus accommodation. Messrs. R. Bradshaw and W. A. Macdonald will journey to Melbourne next week to interview Fitzgibbon." Contributors to this page: PatsFitztrick , blueycarlton , Bombasheldon , molsey , pblue , AGRO , Jarusa , nikki and admin . Page last modified on Friday 07 of June, 2013 23:07:04 AEST by PatsFitztrick. 1985 - Ex Blue Rod Galt to play for Prahran. 1972 - Carlton function with Jones, Keogh, Hurst & Gallagher.